Once upon a time, if you were bored with drab and worn out kitchen cabinets, the only viable option was to replace them altogether. Today, there are a number of ways to spruce up the pantry and storage spaces at a fraction of the cost. As the area’s leading kitchen design specialist, Bargain Outlet has helped homeowners transform kitchen cabinets from dull to dazzling. Replace The Doors: Consider swapping out the old doors for a more contemporary design. Known as re-dooring, the process involves removing the kitchen cabinet doors and drawer fronts with newer ones in colors to match the existing frames. Revive Cabinet Boxes: If the cabinet boxes are in relatively good condition, they can be refaced, which means they’ll remain intact but with some added design tweaks. For instance, the boxes’ panels and sides can be covered in a veneer to match the existing kitchen cabinets. Choose Refinishing: Change the cabinets’ stain color by refinishing them. Stained wood cabinets can typically withstand refinishing, which involves stripping the current finishing, applying the preferred stain color, and adding a coat of lacquer or varnish. 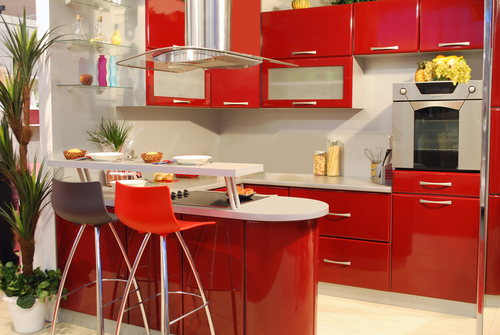 Add Some Color: Select from a wide variety of paint colors to change the entire look of the kitchen cabinets. Solid colors tend to hide the wood’s grain, but the outcome can still be beautiful. For smoother results, completely remove all grime and grease from the cabinets, and buff out any scratches and dents before painting. With 37 locations, there’s bound to be a store near you! Bargain Outlet is your source for everything you need to restore your kitchen cabinets and tackle other exciting home improvement projects. From tools to building supplies, you can count on top-quality products and an extensive in-store stock to get the job done. As an employee-owned company, Bargain Outlet is 100% committed to excellent customer service, answering your questions, affordable rates, and free estimates. Stop in and get started on your next DIY project; to find a store location near you, and to learn more about kitchen cabinets, visit the website.